Diamonds are the hardest naturally occurring material known. To be educated in diamonds and diamond terminology is important whenever you plan to buy any kind of diamond jewelry, be it wedding, engagement, eternity rings or diamond accessories. There are four major categories to consider when choosing your diamonds, namely: Cut, Color, Clarity and Carat. We can look at each of these headings in a simplified manner to give you an understandable knowledge of what's available. Although many jewelers refer to stones as brilliant cut or princess cut the diamond cut should not be confused with its shape. Shape refers to the general appearance of a diamond (as below.) whereas the cut is a reference to the reflective qualities of a diamond. Emerald: Rectangle stones with cropped corners. Fancy: Oval, marquis, heart or pear shaped stones. 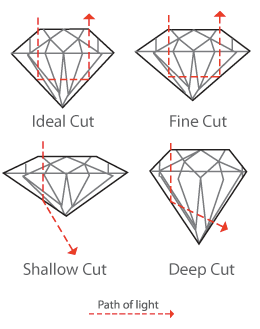 It is an important step to understand how the cut of a diamond affects the quality. In order to reflect the maximum amount of light there are mathematical guidelines for the angles and length ratios at which the diamond is supposed to be cut, if these are not followed light will be reflected and refracted off into the wrong parts of the diamond. Ideal - maximize brilliance and create a great deal of "fire". Premium - often equal in quality to ideal but slightly cheaper. Very Good - most light reflected a slight stray from perfect proportions, often in order to get a larger size. Some parameters can overlap with ideal and premium grades. Good - Much of the light reflected, often sacrificing the preferred range in order to create as large a diamond as possible. Fair & Poor - small proportion of light reflected, mainly aiming for a larger carat weight. When talking about the color of a diamond it is usually a reference to the presence or absence of color in a white diamond. For instance, a colorless diamond acts like a clean window in a house. The cleaner the window the more light can pass through it. In a diamond this will result in the most fire and sparkle. 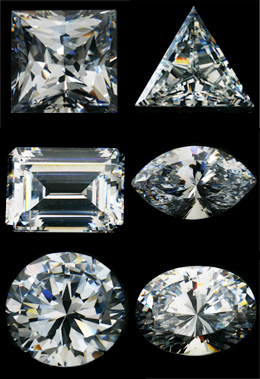 As is the case with diamond cut there is also scale on which diamond color is graded. This ranges from D through to Z with D being the most perfect (and expensive) and Z the least. The clarity of a diamond refers to the amount of blemishes (flaws found on the diamonds surface) and inclusions (flaws within the stone) found in/on each diamond. Seeing as diamonds are not manufactured but formed by earths natural process its no surprise that almost all diamonds have flaws. In the following grading system all inclusions and blemishes are referred to only as inclusions. IF: Internally Flawless: no internal flaws. Some surface flaws. VVS1-VVS2: Very Very Slightly Included (two grades): Tiny inclusions that are very difficult to detect under 10x magnification. VS1-VS2: Very Slightly Included (two grades): Tiny inclusions seen only with difficulty under 10x magnification. SI1-SI2: Slightly Included (two grades): Tiny inclusions more easily detectable under 10x magnification. I1-I2-I3: Included (three grades): Inclusions visible under 10x magnification. ALSO VISIBLE TO THE HUMAN EYE. It is not recommended to buy diamonds in any of these grades. When buying diamond jewelry remember that the clarity grade has an effect on the diamonds value and not on the human visual appearance. The term 'carat' acts as a unit of measurement. It is the international unit used to test the weight of a diamond. One carat is equal to 0.2 grams or 200 milligrams. Carat weight can often be confused with the term Karat which is the term for measuring purity of Gold. When deciding what size diamond to buy remember that size is not always indicative of quality. As mentioned before larger diamonds often sacrifice a perfect cut resulting in less reflection and refraction of light. However having a huge diamond on a finger is extremely dazzling in itself. People often let their budget and/or personal taste dictate which weight to buy.